• Special 2018 High School Preview Section: CB takes a look at all the top teams as well as players across the USA. • Collegiate Baseball’s National H.S. Pre-Season Top 30: American Heritage H.S. (FL) ranked No. 1 followed by Orange Lutheran (CA). • Collegiate Baseball’s 2018 Pre-Season H.S. All-Americans: Big time, elite players named from across the USA on first and second teams. • 2018 State-By-State List: Collegiate Baseball lists top high school players in every state which took several months to compile with the help of college coaches, scouts and high school coaches throughout the USA. 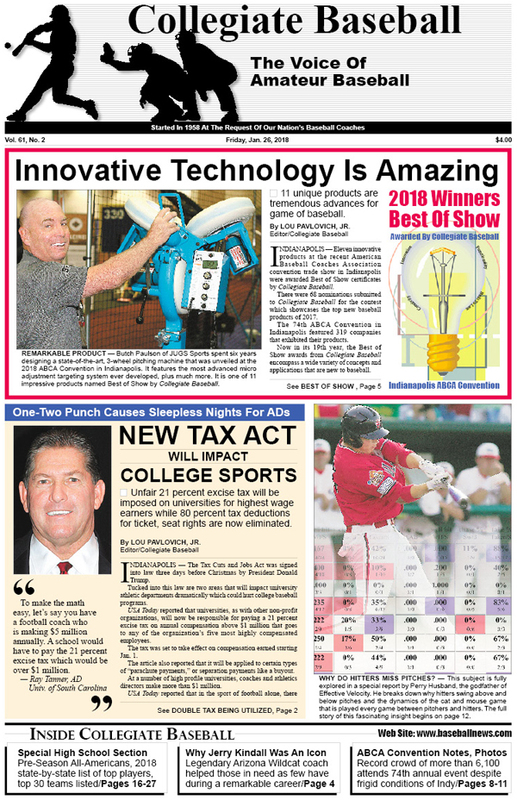 • 2018 Best Of Show Winners: Eleven innovative products at the recent American Baseball Coaches Association convention trade show receive special awards from Collegiate Baseball. • Why Do Hitters Miss Pitches? : Perry Husband, the godfather of Effective Velocity, breaks down why hitters swing above and below pitches and the dynamics of the cat and mouse game that is played between pitchers and hitters. • New Tax Act Will Impact College Sports: Unfair 21 percent excise tax will be imposed on universities for highest wage earners over $1 million while 80 percent tax deductions for ticket, seat rights are now eliminated. • Lou Pavlovich Column: Jerry Kindall, former legendary University of Arizona skipper who died on Christmas Eve, was that rare, caring man who helped many in need. • Jack Dunn Column: Pitcher’s best friend (double plays) can be the most spectacular play in baseball as they snuff out rallies. • ABCA Convention News: Record 6,100 people attend American Baseball Coaches Association Convention to set all-time mark. Ejections were up last season in NCAA baseball, 16 national seeded teams will be chosen for the first time in 2018, future NCAA legislation and an update on the Recruiting Calendar legislation for NCAA Div. I. • Numerous Awards At ABCA Convention: Here is a rundown on every key award presented at the Indianapolis event. • Two Photo Pages Of Event: Amazing clinic sessions are featured along with important award winners. • Ruleball With Rich Marazzi: Don’t be afraid to challenge an umpire on a rule misinterpretation. To purchase the Jan. 26, 2018 edition of Collegiate Baseball or subscribe, CLICK HERE.